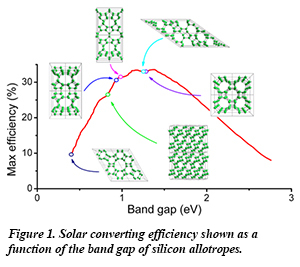 Carnegie's Zhisheng Zhao and collaborators from Yanshan University, Nanjing University, and the University of Saskatchewan, reported six theoretical silicon allotropes with direct or quasidirect band gaps that would more efficiently absorb and use solar energy. Commercial silicon solar cells produced currently have only 15-20% converting efficiency. The deficit is due mainly to the indirect band gab of the current silicon material. The newly designed direct band gap silicon allotropes can reach the optimum value of higher than 30% solar converting efficiency. In addition, these structures can absorb sunlight with different frequencies, providing appealing features for application in the tandem multi-junction photovoltaic modules [Q. Wang et al., J. Am. Chem. Soc. 136, 10173 (2014)].